Bill Diaz is widely credited with establishing the University of Miami Swimming and diving program as one of the nations elite. 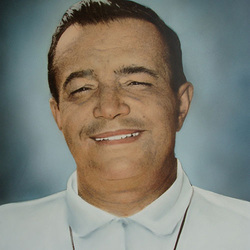 Diaz coached the Hurricanes swimming and diving teams for fourteen years, from 1971 to 1984. During that time, his squads posted four top-10 NCAA Championship finishes and finished in the top-20 at the NCAA Championships eleven times. In 1974, 1977 and 1982, his men's teams won National Championships. Diaz's 1975 women's swimming and diving squads won six individual national titles, the most the University has ever won in a single year. Coach Diaz was also very active on the international scene. As the team manager of the 1976 U.S. Team during a tour of Brazil, Argentina and Uruguay, Diaz hosted a clinic for forty South American Olympic coaches. He and his wife Martha have three sons. Sadly, Coach Bill Diaz passed away in September of 2014.